EarthCam, the leading provider of construction camera technology, announced the newest feature set for its continued integration with Procore at Groundbreak in Austin, TX. We are empowering users with data-rich media that is simple to analyze and understand. EarthCam, the leading provider of construction camera technology, announced today at Groundbreak the newest feature set for its continued integration with Procore. 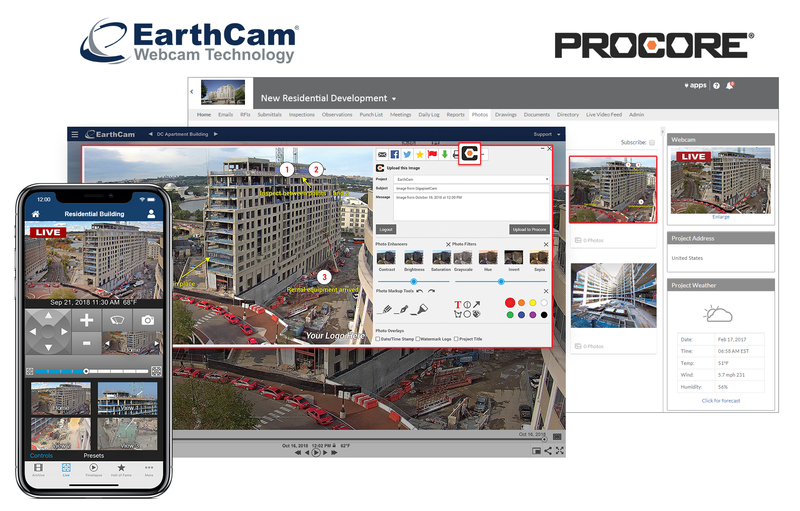 Building upon its existing integration of live streaming video and megapixel imagery, EarthCam’s Control Center 8 software-as-a-service (SaaS) now gives Procore users access to even more of EarthCam’s high-quality construction camera content, including gigapixel panoramas and interactive 360° VR media, for a comprehensive overview of exterior and interior project progress. The recently released Version 8.5 of EarthCam’s software features added support for Bentley Synchro 4D models and Autodesk BIM 360, where users will benefit from the ability to view their EarthCam cameras in relation to BIM, Navisworks and Revit models. Users can perform live comparisons and execute measurement functions between webcams, 360° VR photography and 2D, 3D or 4D models. EarthCam has created a two-way highway for sharing jobsite imagery with the added support for users to import additional progress photos from their Procore projects into its Control Center 8 SaaS. Project managers can utilize the visual content in several beneficial ways, including adding visual support for efficient RFI management, verifying punch list tasks and expediting submittal reviews by attaching webcam content. Users also have the ability to incorporate 360° photography media into drawings to verify design plans and identify potential safety issues. Additionally, users can access their Procore contact list, making it easy to share important visual updates directly with their team. Video content is also a major part of this new integration phase, enabling users to share important video recordings and time-lapse movies directly within Procore albums for further insight into jobsite activity. All of the content can be viewed in a full-screen display and is easy to share for effective communications. Going beyond visual updates, EarthCam also provides integrated sensors to deliver critical jobsite data for further analysis. With EarthCam’s VR Site Tour app, every 360° image includes multiple points of environmental information, including temperature, humidity and dew point at the actual jobsite location. These statistics shed light on real-time conditions that may negatively impact the project timeline or create an unsafe work zone environment, such as icy work surfaces, enabling the team to act swiftly and make important decisions quicker. In addition to the robust offering, single sign-on (SSO) was also rolled out, enabling Procore users to unify and streamline access across platforms. Combined with EarthCam’s professional line of live streaming video cameras and time-lapse construction cameras, the valuable content is easy to analyze and is driving productivity for a more informative jobsite. To learn more about EarthCam’s integration with Procore, visit EarthCam at Groundbreak Exhibit 106, November 13-15 in Austin, TX, or http://www.earthcam.net/procore. EarthCam is the global leader in providing webcam content, technology and services. Founded in 1996, EarthCam provides live streaming video, time-lapse construction cameras and photography documentation for corporate and government clients in major cities around the world. EarthCam leads the industry with the highest resolution imagery available, including the world’s first outdoor gigapixel panorama camera system. This patent-pending technology delivers superior multi-billion pixel clarity for monitoring and archiving important projects and events across the globe. EarthCam has documented over a trillion dollars of construction projects around the world. The company is headquartered on a 10-acre campus in Northern New Jersey and maintains 13 additional offices worldwide. Projects documented by EarthCam include: Hudson Yards, Panama Canal Expansion, 9/11 Memorial Museum, Atlanta Falcons’ Mercedes-Benz Stadium, Golden State Warriors’ Chase Center, Statue of Liberty and Washington Monument Restorations, Governor Mario M. Cuomo Bridge, LaGuardia Airport, The Jeddah Tower, 56 Leonard Street, 432 Park Avenue, Los Angeles Rams’ Stadium, Las Vegas Raiders’ Stadium, Qatar Rail, Whitney Museum of American Art, Louvre in Abu Dhabi and Smithsonian National Museum of African American History and Culture. With EarthCam's expanded Procore integration, users can perform live comparisons between webcams, 360° VR photography and 2D, 3D or 4D models. EarthCam's Procore integration continues to deliver valuable visual information for a successful project management process.